Other craft circled as they waited for clearance to land, so Alicia and her group were able to catch a view of the monuments and D.C. itself. Monuments shone in white, defined by the large groupings of greenery around them, and the White House rose above the city like the fortress it had become after the large uprising that had nearly toppled it and changed the world. Alicia remembered the feeling of terror as she watched the news years ago, still in school, witnessing the militia charging in. It hadn’t lasted long, but the extensive damage and trauma of it all had convinced Washington of the need for better defenses. The Washington Monument had also been taken out by an attack that day—a symbolic gesture—but now rose twice as high, a spiraling tower with colored glass near the top that glimmered in the sun and ensured everyone knew it was there. No longer just a monument, its missiles and radar made it part of the capitol’s defense network. North of all this, fancy new apartment complexes rose into the sky. Triston had his seat’s screens working, and several were projected from the armrest to hover in front of him, one with words flashing: Access Granted. “And how do we know it’s not a trap?” Alicia asked. It wasn’t like she was expecting to be reassured, but it would’ve been nice. At this point, there wasn’t much she’d put past New Origins. They’d already sent their elite warrior group, the Taipans, after them, as well as placing a bounty on their heads. 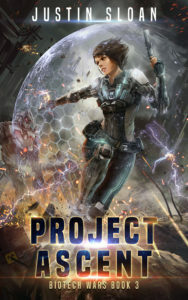 The plan to stop New Origins would’ve been snuffed out by Project Destiny, of which the Taipans were a part, if not for Pete switching sides., Though the real blow—taking out Nightshade herself—had been a combined effort by Marick and Alicia. He tapped his screen and then pointed to her wrist, and when she’d opened the screen and hit accept, he swiped over and watched the screens appear as smaller projections in front of her. “Then we need the government to take over,” Shrina said with a shrug. “Like any government,” Marick countered. “What?” Alicia sat up, turning to the window just in time to see the reflective sheen of a stealth fighter craft, then the blast of missiles. The jet lurched forward as she yelled for Pete to get in his seat, and then they were moving on to evasive maneuvers. A commercial jet flew past, dangerously close, and then an explosion sounded nearby, though they couldn’t be sure what had been hit, if anything. Alicia braced, watching as Pete was jerked to the side. Only his enhanced strength enabled him to pull himself back to his seat and get strapped in. Perfect timing, too, because the jet was moving at an angle, turning back around, and spiraling down toward a path on the other side of some greenery. For a moment, it looked like they were veering back toward the river, but then the jet cut to the right, surprising a couple of bikers below, and pulled to the side, bringing them around as missiles exploded behind them. Another explosion sounded overhead, but this time Alicia was able to identify the source as a series of Air Force fighter jets soared past. One of the enemy craft lost its cloaking, broke apart, and fell into the river. That wasn’t the only one out there, though, and soon the Air Force fighters were engaged with a second stealth craft. For a minute they thought they were going to make it, but then they saw the ground coming up fast as the jet they were on lost control. They were going to crash. Marick was up, dashing forward to the cockpit. Alicia was about to follow, but she was jolted about and had to brace herself just to keep her head steady. From where she sat she saw Marick brace himself, then swipe on his machine and scan the ground. Either he was going to teleport out of there, which she didn’t find likely, or he was going to try something incredibly brilliant. A split-second later he had his hand outstretched and the jet was pushing against a force made from the alien tech—like they were levitating, but not quite. She made a mental note to ask him about that later, along with any other extra functionalities he’d learned his suit was capable of. Then they were on the ground, miraculously landing without any casualties—yet. Marick ran back to check on Alicia, moving as the jet slowed to a stop. Alicia debated arguing, but then an explosion went off nearby and shots riddled the ground just outside the window, reminding her it might be just as dangerous if they stayed on the plane. She nodded and moved to Marick’s side. They all exited and ran for the nearby tree line, with Marick and Pete helping Shrina and Triston move faster. Behind them, the jet used the walkway to take off, hovering in the air for a moment before taking flight. He looked from her to the crowd of people watching the battle in the sky between the Air Force and the one remaining stealth craft, which was now in retreat, it appeared. Beyond the crowd were the three arches of the Air Force Memorial, along with more high rises and evidence of more advanced businesses that didn’t stick to the older look of downtown D.C.
“We gotta move,” Triston said, nodding to a section of the group that had noticed them and was pointing. Instead of staying on the path, they moved into the trees in case the stealth craft returned or others came their way. The trees had been built up over the years to provide more of a natural barrier between housing and the airport. In terms of cover, it wasn’t much. It worked for the moment, and it was possible to follow the pungent gingko trees all the way up to the next bridge into the city. From there, they would have to hope no more enemy stealth craft were on the lookout. “D.C. always like this?” Marick asked, wiping sweat from his brow. “Try wearing a suit and tie,” Triston said, pulling at his collar. His undershirt was already starting to show sweat marks. They were all wearing the clothes the ambassador had arranged for them except Triston, who preferred his suit, at least while they were on the plane. Now that he was out in the humidity of D.C., he was probably rethinking that decision. She smiled, then laughed at the way the others were looking at her. Alicia chuckled, seeing the look in her sister’s eyes and suspecting she more than just liked the guy, but she let it go. Marick was right. They still had a ways to go before they’d be in the city, and anything could happen between here and there. FROM JUSTIN >>> Here it is – book 3 in the trilogy! I’m aiming to get this to you early, like perhaps the 20th of March. Fingers crossed! It follows the end of book 2, and we’ll get into the action right away. So far I’m hearing it’s the best of the series, the most action packed, and people are even claiming it’s my best writing. Yay! One man. A secret power that could change the galaxy. Two entire universes in pursuit. 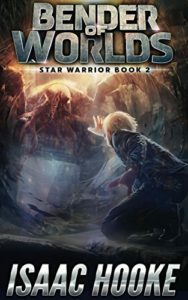 Tane crosses the galaxy in a race against time to unlock the hidden powers inside himself before his enemies can capture him. With his companions, he moves between this universe and the next, pursued by the governments of aliens and humans alike. To fail means capture and mindless servitude, as those governments would turn him into a tool for their wars. To succeed means his freedom, and perhaps something more. Hunted and attacked at every turn, eventually Tane finds himself backed into a corner, with no hope of escape. But those who pursue him do not understand that Tane has only scratched the surface of the awesome power inside himself. And if his enemies press too hard, poke too deep, they might not like what rears its ugly head back at them. Yes, they do not understand. The Bender of Worlds has only just begun to awaken.